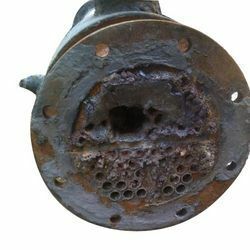 Heat Exchanger Repair Services include Cleaning, De-sealing, replacement of Parts, Replacement of Tubes, whatever is necessary to make your Heat Exchanger good as new. Pressure Testing is done to eliminate any danger of Leakage. 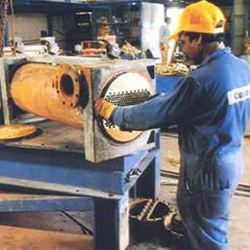 We are instrumental in rendering efficient Heat Exchanger Repair Services to the patrons. The professionals working with us to render these services are capable of providing quick diagnosis and resolution to all types of challenging problems. Our services consists of cleaning, de-sealing, replacement of parts, replacement of tubes or whatever required to make the clients' heat exchanger good as new. Further, our experts also do pressure testing to eliminate any danger of leakage. The Timely Cleaning, Servicing, Repair and Reconditioning of all types of Heat Exchangers is very essential.Failing in maintenence and checkup may result in severe Damage to the Heat Exchanger and In turn to the Process Fluid and halt production unti replacement. 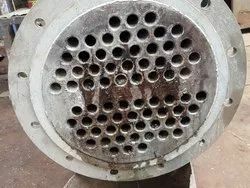 The photograph is of a oil cooling heat exchanger which had been used continuously without tube cleaning for much more then advised service period. Customers can avail these maintenance services from us followed by leakage testing. 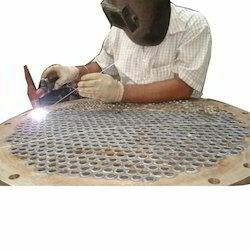 Backed by the team of deft experts, we offer services repairing Heat Exchangers. These services are rendered by a team of skilled experts using latest machines and tools. 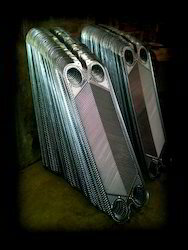 Our employees identify and correct the problems of the heat exchangers, before major damage occurs. All our services are globally acclaimed by the clients for their promptness, reliability and use of latest technologies.